230VOLTS POWER CARVING DUST COLLECTOR. Keep your power-carving area clean! 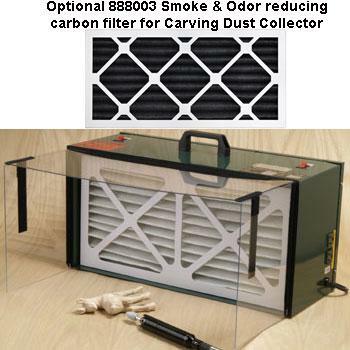 Also, optional 888003 carbon filter reduces wood burning (Pyrography) smoke! This handy dust unit is lightweight, compact & portable. Perfect for carving on the go! Simply set it on any table or bench, plug it in & switch on! Eliminate power carving dust, without hoses or balancing a board on your lap. Features: 2-whisper-quiet computer grade fans drawing up to 500 CFM (cubic feet of air per min. ), fans individually switched to control air flow, efficient industrial grade filter system (traps 90%+ carving debris) plus 3 clear folding dust shields & standard duplex outlets to power your tools. Overall dimensions: 20cm x 27cm x 53cm. This is the international model for use with 220-240VOLTS power only (1 amp). CE marked. For North America order the 110Volt model item: 888001. Note: For replacement filters order item: 888002. For optional carbon filter for smoke and odor reduction order item: 888003.